The Huxley has a heated aluminium bed, which when covered in Kapton tape provides a very robust, flat and sticky surface for plastic to adhere to and I only had a minimum of warping with both ABS and PLA. By contrast, the PrintrBot Simple Metal does not come as standard with a heated bed, which means I need to get creative with my bed preparation in order to achieve successful prints. PB themselves recommend using blue painters tape which does work, however I got a lot of edge curling and warping even with the bed perfectly level, Z height optimised and auto-levelling enabled. As mentioned previously, I'd had a lot of success in the past using Kapton tape and a heated bed on the Huxley, although I did still get some edge curling even with that. 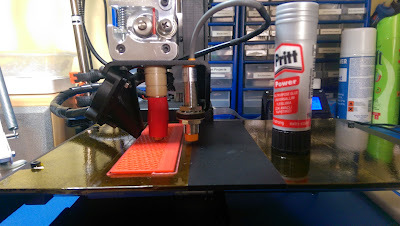 I've got a couple of PCB heaters which I'm going to modify for use with the PrintrBot, however until that happens, I need a solution for cold bed printing, especially with large objects. I'm not a big fan of rafts and brims, even though they will help of course - mainly this is because I want to do the minimum of finishing on most objects. The first thing I tried was the blue painters tape I'd already bought (3M Scotch 2080EL) and covered the print area in a light coat of Pritt Stick Power glue - this worked very well on smaller objects and kept them stuck down nicely during prints. Larger prints still had a bit of curl on occasion, but this was mainly down to the painters tape itself lifting from the bed. Removal of finished objects was very easy - just lift the object with the tape attached to the bottom and run it under warm water to remove the tape. I next tried just Kapton tape - this stays stuck well on the bed, but the PLA lifted from the cold bed a bit to easily, resulting in a couple of spoiled prints that got knocked off midway through the job. So...logically the next step is a layer of my Pritt Power stick on the Kapton tape. Mission accomplished! It's absolutely rock solid - prints don't move, warp or curl - not even a little bit! The issue of course, is getting the bloody thing off the bed once it's finished. Seriously, I never expected it to work quite this well, even on huge prints that use the entire bed area - I lost a couple of absolutely superb prints just trying to pry them loose - in a couple of cases the print de-laminated from it's bottom shell, and on one occasion I actually broke the damn thing in half...I was so happy after a 15 hour print as you can imagine! So the solution to this is just to understand that your Kapton tape is sacrificial, which given it's price is a shame. However for me, this is worth the cost just to get the perfect print I want. Basically, in order to remove the object from the Pritt covered Kapton I either peel up the tape surrounding the object and gently tease the tape from the bed, or by carefully working my way around the edges of the model with a hobby knife, and can usually get it free enough to pop a larger putty knife under the model and pry it free. Once the object is off, the tape can be carefully peeled back without de-laminating. I have also tried hair spray on Scotch Painters tape without much success - I got the extra hold type, but even an extremely light cover just saturated the Scotch and made it literally fall off the bed. I haven't tried it on Kapton yet, but will at some point. I also picked up some low tack PVA glue to try as well. I've also found that letting the print cool for a good 20 minutes before removing it helps.